On my first bicycle trip, I left Jasper with a too-heavy trailer and made only 35 kilometres the first day. When I reached camp, I was so tired that I set up tent, ate an energy bar, and fell unconscious on my thermarest. I awoke later to the brilliant Milky Way–traditionally a “navigation chart” for travelling through this world as well as the great cosmologies and spiritual traditions. The next morning I was consumed with doubt — could I really complete a 5000 kilometre solo trip through British Columbia? Four months later, I rolled into Lake Louise, Alberta completing the route. The trip and its conclusion paralled the roads taken: lots of ups and downs, detours, change in plans, fears and strangers that became friends, unexpected encounters, smiles and tears, joy, and moment-by-moment grit and gratitude. For my sabbatical in Hawaiʻi, I chose my Brompton folding bicycle as the main mode of transportation. With few exceptions, I use the bicycle for getting to-and-from classes and meetings, shopping for food or apartment furnishings, running Zander, exploring the neighborhoods, or getting take-out meals. Walking, occasional use of a ZipCar, and bus are secondary choices–and often not as convenient as the bike. (breadfruit) hanging low on the tree; recognizing flowers (plumeria, mock orange, white ginger, or night-blooming cereus) by their fragances–or lack of; or tracking the sun and moon rising and setting on the horizon. Reading street signs is like a “whoʻs who” of Hawaiian history and a constant opportunity to practice pronouncing Hawaiian words. Wednesday and Thursday evenings are shopping at two local farmerʻs markets: Zander surveying the vendors from his perch between the saddle and handlebars and delighting in the attention from other shoppers! The Hawaiian word kuleana often comes to mind. English translations rarely do it justice, and English words struggle to capture the interconnected, spiritual, ethical, and relational qualities integral to this concept. Even as I think I am beginning to understand its breadth, I am not sure, as a haole (foreigner), I can truly understand the fullness of its meaning. Kanaka Maoli (Native Hawaiian) writers begin with broad contextual phrases: an understanding that begins with participating in context-based responsibilities and positionalities located in interdependence of people and place (Goodyear-Kaʻōpua (2013). Specificaly, kuleana connects with responsibilities, obligations, reciprocal and respectful relationships. Kuleana is about the proper way to be amongst humans, ancestors, unseen forces, ka ʻāina (land and ocean), animals and plants, and the universe. Importantly, it includes the concept of privilege as in it is a privilege to be in a position to share one’s gift, to contribute, and hold a particular position. When kuleana appears in conversations, discussions and stories revolve around how individual lives nourish the community, how we honour our ancestors and and gifts, how we contribute to the well-being of the whole. As far as I understand, it is a concept that begins and ends with an embodied way of being enmeshed in each other. As a haole and daughter of an officer of the occupying military, my reflections include a deep understanding of how my birth at Tripler Hospital in Honolulu, travels to Hawai’i as a visitor and tourist, and interest in Kanaka Maoli practices are all haunted by the harm experienced by Kanaka Maoli through illegal occupation, land reforms, and privileging wealth over relationships and environment. My contemplations around kuleana are infused with a desire to allow Indigenous worldviews (especially Kanaka ‘Ōiwi) to change what I think and who I am. I am still piecing together the embodied and enacted meaning of kuleana, but cycling creates a space-time for me to reflect and be entangled in everyday human lives and natural/built environments that call out for kuleana. Surprisingly, these are often momentary and mundane encounters. I live near two private schools, a seniorʻs home, two medical centres, and two off-on ramps to the freeway. The traffic can be horrific with blocks of cars inching along and adjusting for parents dropping children off at school, ambulances, or older and slower pedestrians. Typically just before and after school, three traffic cops, a host of mothers helping children in and out of cars, parental chauffers, and alert drivers keep people safe and the cars moving at a steady pace. I, too, merge, measuring my cadence, become part of the alternating pattern, and use hand signals and waves to thank drivers who see me safely through. It is a dance of taking care of each other. It is a subtle pattern that makes a tedious routine more comfortable–often bringing smiles. I have begun to see kuleana as an outward perspective that focuses attention on what is and what can be contributed to life at that moment–even traffic! The more I contemplate and look for it, the more opportunities appear. I realize how intertwined I am with the world and how every action has a ripple effect. Bicycling viscerally places me within this net of life forms and energies: a lost key found where I dropped it next to a bicycle rack; people who offer water to Zander; students in class who generously share notes and study time; the cashier who reminds of me of sales or loyalty cards to save money; the gardener who shares a papaya from her tree; fellow cyclists who are homeless stop to help or provide hints on thrift stores. Cycling provides space-time to understand on how little I need or how to choose activities that nourish the land, sustain others, and honors the genealogy of Kanaka ʻŌiwi. And a day filled with cycling leaves me relaxed, active, and content. As Zander and I are slowly knitted into local communities, I pay careful attention for opportunities to contribute to their lives and futures. Notably, kuleana circles back to things! On long distance bicycle trips, I learned to reduce what I carried; too much stuff makes it harder to pedal and slowed me down. This sabbatical is restructuring what I need materially and having little actually provides a sense of freedom and relaxation. And this opens up more space-time to be, to focus outward and contemplate my intersection with others, time to play with Zander and others. Although I am not convinced of the accuracy of my interpretation, simply struggling to understand another worldview and its spiritual and ethical implications has already shifted my sense of self–and how out-in-the-open-cycling contributes to a life of service, acceptance of the privilege and responsibility, and care for the ʻāina and others met along the way. Traveling by bicycle is an unassuming entrée into the world of other people. Add a small, shy but friendly dog, and I have the perfect combination for meeting people from all walk of life and getting to know Honolulu. Bicycling allows me to keep Zander fit as he runs alongside when it is safe or the temperatures are cool enough. When time is of the essence or traffic is crazy, I pop him in the seat and move at a faster pace. Ruffwearʻs Swamp Cooler vest extends the time Zander can enjoy the day. A number of stores allow dogs–so he accompanies me to Home Depot, Don Quixoteʻs, and other places if he sits quietly in the carts! He is learning his manners as he waits outside when I pick up food–and then off to a nearby park for a picnic. The King Street bicycle path reminds me of Copenhagen–and we cover substantial distance for all our errands: credit union, pet store, grocery store, bicycle store, and other necessary stops in safety. And, of course, moving slowly and together allows us to meet people along the way. Zander’s “smile” while walking often elicits comments or questions about his linneage; the elderly Japanese man who walks his daughters dogs loves to talk to Zander and share a “high five”; the woman groundskeeper at the school bows deeply to say good morning; the elderly couple who have their breakfast on the lanai have just begun to ask how are we doing; and the grade three girl at the farmer’s market who loves dogs holds Zander while I order dinner. Precious is the “resident mama” of the apartment complex. She is pregnant and has recently become infatuated with Zander!!! The three cats, on the other hand, seem not so interested! Bicycles are relatively plentiful in Honolulu–parents with trail-gator bikes or chariots, for children, families on a series of bicycles, people commuting to work or school, the classic cruiser bikes, fixies, bmx, and of course the serious cycle racers. As in many places, bicycling is a process of being “out in the open”–pedestrian and cyclists waiting at lights often say high, drivers giving way or accepting your offer to go ahead, or someone noticing Zander on the bike. Given how dense Honolulu is, I always find it easier and quicker to maneuver on a bike compared to the traffic, parking structures, or lack of parking spaces. And with courtesy and consideration for pedestrians, no one seems to mind if I ride on the sidewalks. As part of our daily routine, Zander and I walk or bicycle-run early in the morning or evening when the the temperatures are coolest and rain is likely to fall in short bursts or mists that cool. We seek new routes to discover old cemetaries, ranges of housing designs, and local haunts such as Yama’s Fish Market and their delicious Kalua pork, poke and haupia. Three guys provided an impromptu ukulele concert while we ate lunch in Honolulu Stadium State Park. People from all walks of life share their lives whether in fragments or life histories. Honolulu and the people within become mapped onto Zander and I and we become enmeshed into these currents. A passing park, stream, memory shared, helping hand, or glimpses of cattle egrets, red-crested cardinal, or shama grace our lives. In the verdant Hawaiian valleys, a balance must be struck betweeen removing invasive species and epiphytes and supporting native and food bearing species while providing space to wander amongst them. It takes time to understand the relationships since an “invasive” species might, in a particular instance, enable a native species to thrive. This was the world I entered in a small patch of tropical flora behind a friend’s house in Pauoa Valley. Lychee trees supporting avocado trees; bamboo forests obscuring ancient trails; vines swirling around trees and plants on their way to the sun. To enhance the health of this small patch required daily attention. So, careful observation, listening to multiple stories, and taking time before action is a wise course of action. A great metaphor for moving to a new place, adjusting to a new climate, starting a new project, or learning to play at a dog park! August is a not month in Hawaiʻi–tropical storms bring rain and cool winds followed by “dead” air and heat. We are up early (5:30 a.m.) to enjoy a cool morning walk or run. Then Zander wilts and hides beneath my desk under the cooling breeze of fan until late afternoon. I find time to work or do errands–slowly adjusting to the heat or running in and out of air conditioned stores or offices. many birds and animals are present in the middle of the city, and how cooling the rains are. Then, the sun sinks and the temperatures drop. A group of women and their dogs show up at the dog park next to our apartment at 6:30 p.m. Zander is slowly learning to “play” with the other dogs rather than constantly jostle for dominance. Yet, each night as we return, the relationship slowly morphs into new forms of play and enjoyment. Other evenings we go for bike rides around town–he in his seat on the bike. Iʻve met with the director of the Institute for Hawaiian Language Research and Translation. In addition, I attended a symposium on their translation project with the Hawaiian Mission Houses Historic Site and Archives. They are translating a collection of letters from the aliʻi or members of the ruling class of Kanaka ʻŌiwi (Native Hawaiians) that are part of the Mission Housese archives. The panel was simply amazing; each had been translating specific letters that supported dissertations, books, or journal articles. The perspectives and insights are radically different from the classic American historical perspectives. As much as I was excited and intrigued, it was daunting as well. as meet interesting people, notice how many people (drivers and pedestrians alike) who are generous and courteous, variations of architecture, wondrous gardens, and much more. All of this brings home the transitory nature of life–the older buildings giving way to the environment, dying flower petals on the ground. Each of these have a beauty of their own and a reminder of the wisdom in allowing things to follow their own lifespan. And finally, negotiating traffic as well as life requires movement and balance. Against all conventional wisdom and the odds, I am re-inventing myself as a scholar at the end of my career and within sight of retirement–beginning with a sabbatical in Hawai’i studying the Hawaiian language and working with 19th century Hawaiian-language newspapers at the University of Hawai’i Manoa. Surprisingly, this adventure includes many different kinds of risk–much like my bicycle trips. And, of course, I am taking a bicycle for transportation! After many second-thoughts and doubts about health, the career implications of a radical change in research focus, and the obstacles of taking Zander, I took a “leap of faith” and applied for a federally funded research grant. It was a long shot, but the application was fully funded; my last sabbatical before I retire was approved; and my house was rented three days after it was listed. It seemed like the universe was responding with a resounding YES!! On the other hand, my ferritin level dropped to zero, cataracts were diagnosed the week before I was to leave, and a flurry of unexpected work deadlines led to a hectic eight weeks before the departure date. Just because something is meant to be does not mean it will be easy or without obstacles. And yet lessons learned from bicycle touring have been a source of strength. Since I was renting the house for the year, I used the opportunity to re-think what I really needed both to store while I was gone and to take to Hawai’i. The list has changed since I now have other health considerations and Zander’s well-being to consider; yet it was amazing how much we could give away. On the other hand, the large suitcase, folding bicycle, and kennel plus carry on (a small backpack and ukulele) reminded me of packing for a river trip! The first few days of any trip are filled with excitement, trepidation, and “re-shaping” the body for change (whether the hills of mountains and long miles, noise and bustle of airports, or schedules and patterns of other people and cultures). A sense of wonderment, gratefulness, and laughter transform all of these into life’s lessons. Our three days with my brother and his family come to an end tomorrow. Zander valiantly tried to woo Roxy, their little dog, but she was having none of him. However, they both tolerated each other in search of treats in the kitchen. The sun was warm and ocean breezes cool in the evening — with three days of rest and time in their pool. A wonderful way to begin the sabbatical and Hawai’i adventure. The trip to Blomidon Provincial Park made clear that cycling with Zander’s seat was hard on the knees and the hills of Cape Breton were simply not possible. In addition, the set up of the trailer was not appropriate for the Surly Troll design. Sooo—I rented a car, and Zander and I took off for a driving tour. The comparison of bicycle and car touring provided many insights. Even as I drove up from Truro, the landscape began to change, and the hills became more longer and steeper. I was consistently evaluating each section “as if” I would ride it as a cyclist. Even though the hills on the Cabot Trail are much more challenging, simply getting to Cape Breton from Truro would test a cyclist resolve. When we passed several bicycle tourers, I was flooded with a longing to be on the bicycle, pedaling slowly up each of those hills. I am not sure how to explain how the process of cycling through the landscape changes the way a cyclist views the world, shapes the cyclist’s body and understanding of the world, and becomes addictive as a way of movement. Furthermore, as I would discover, it also shapes how people interact with Zander and I. However, the hills would have been murder on my knees, so it was a wise choice to drive. The landscape is gorgeous, and the rains had turned it very green. But driving allowed for few opportunities to stop and take pictures until we got over the causeway and on the Ceilidh Trail. We stopped at the first turn-out and viewpoint which paralleled a bicycle-walking-ATV trail. Zander and I walked a fair distance along the path. While I took photos, Zander collected scents from each place we stopped! I am hoping to have him bathed and groomed before we fly home!! 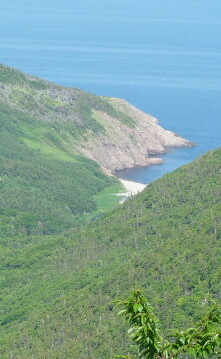 We will only see a small portion of Cape Breton that highlights the magnificent scenery. However, the island is dotted with reminders of its resource extractive industries: the Troy Quarry we passed just west of the causeway that has left a huge scar on the land, clear-cutting patches, signs indicating old gold mines, the coal mines that once existed near Sydney, and sites of old settlements that were established for logging or mining purposes now wilderness sites along the Cabot Trail. Our first campsite was at Cheticamp Campground within the Cape Breton Highlands National Park. We went in to town to get a lobster dinner “to go,” because it was too hot to leave Zander in the car. I ordered the smallest lobster (2.5 pounds) and thought the woman said they would crack it, but couldn’t provide any other utensils for getting the meat out. Well, she had actually said they wouldn’t crack it—and 2.5 pounds of lobster is a lobster bigger than I have ever seen!! Seriously—that is a lot of lobster!! But my faithful Swiss Army knife came to the rescue! It was neither elegant nor pretty, but I got every bit of that lobster meat out! And it was delicious. Of course, Zander got some (minus the butter) and thought it was good too! The next morning, we were up early. One of the wardens stopped us, because she had found a beautiful white dog with a red T-shirt wondering loose in the campground. We had not seen it before. We walked through the campground hoping to meet someone looking for a dog, but no such luck. As we left, we stopped at the warden station to leave some food. Fortunately, the owner had arrived. They had come in late, and the person who had attached the leash had attached it incorrectly. The T-shirt was covering a scar healing from surgery. It had been the longest 15 minutes of the woman’s life. What a great way to start the morning! We saw the fishing boats out, so I pulled over and we walked along a small beach. 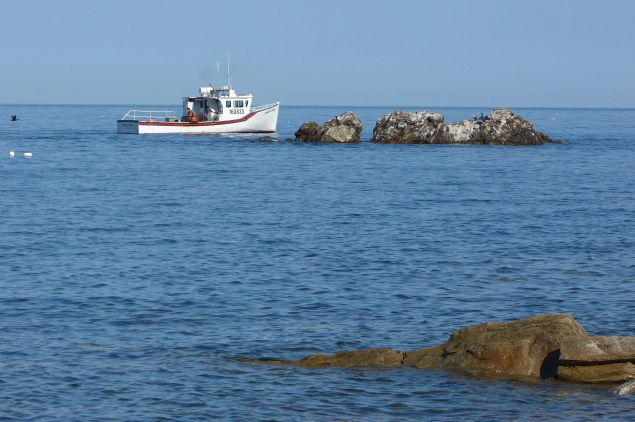 The boats were coming back in to retrieve lobster traps. We stayed awhile to watch them move along their lines and allow Zander to dip his paws into the water. Then, up and around the northern tip; we stopped at most of the viewpoints. My favorite was Fishing Cove, which lies 335 metres below MacKenzie Mountain. This lonely spot was a thriving Scottish settlement that fished for cod and lobster and farmed with a lobster cannery. By 1915, the descendants of these pioneer families had all moved to neighboring communities. Today, this site is now a wilderness campsite accessible by an 8 km hiking trail. I only wished we had the gear and time to enjoy the site! Before we knew it, we were at Baddeck. I was amazed at the difference in how much distance and how little time it took with the car. But I was saddened that it was bereft of conversations, smells, a sense of being shaped by the landscape. Baddeck is a small town and clearly focused on tourism–lots of B&Bs, resorts, a few restaurants, the classic restaurants and cafes, and the typical Home Hardware and Co-op Grocery Store. The weather had turned hot (+28 C), leaving Zander in the car was not an option, and few places had shade for parking. Because my gut wasn’t feeling so good, I opted for the cheapest room in Baddeck that would take a dog–the Inverary Resort and Spa. It was okay, but this traveling is so different and doesn’t allow for meeting people. Without pulling up on a bicycle with gear, people simply serve you. As I walked to our room, I passed an older gentleman sitting in a car, door open, head almost between his knees. I asked if he was okay. He seemed annoyed, almost angry, when I expressed concern.The etiquette and connection between people is just different in these other zones of travel. All of these experiences led me to contemplate what I truly enjoyed about traveling–especially bicycle travel. Would joining a Freewheeling tour be enjoyable? Would a custom tour work? What is so appealing about traveling alone with all my gear? Could it be modified? If so, how? Do I enjoy seeing all the historical sites, museums, etc? But I am sure that I do enjoy the act of cycling the landscape and the exposure to the land with all of its smells, ups and downs, weather, etc. There is something about that process that changes how I relate to the world, know that part of the land, and come to understand myself and the people there. The next morning, we left Baddeck headed for Wolfville. First, we stopped at Black Brook beach before it got too hot. It was a great place to take a walk up along the Black Brook, more like a river, along the beach, and up and through the coastal trail. We could see the river running into the sea, the fresh water mingling with the sea water, and the tides pushing back on the river currents. We walked along the coastal trail and some side trails to get better views of Black Brook Beach and the waterfall–including Zander sitting on an Adirondack chair to enjoy the view. 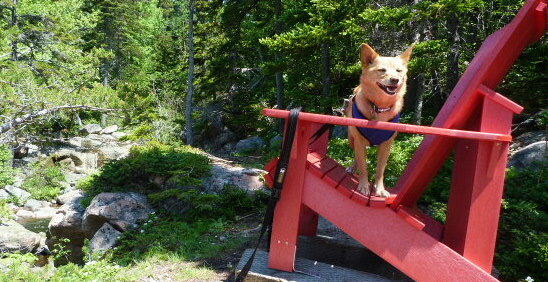 Zander also had great fun collecting all the different scents, chasing squirrels and chipmunks, and generally sniffing. A little further down the road, we also checked out Whycocomagh Provincial Park. Although I was glad I had opted for the motel, this would have been a great campground. And oh the squirrels and chipmunks!! Even though it was hot, we spent a fair amount of time scaring up squirrels and chipmunks as we explored the campground and trails, saw the yurts, and talked with people who were staying there. Zander even scared up a whole bunch of grouse. The mother grouse froze, standing tall like a stick. Zander went slowly a little closer, but when he realized it wasn’t a squirrel, he turned back. She flew up into the low branches of a tree to join her brood. We stopped in Windsor, just shy of Wolfville, for the night. The next day, we drove into Wolfville just before Sue and John took off for Prince Edward Island. It was a quick trip, and I’m glad we went. Even as I felt the tug of the pedals with each bicycle tourer, the lack of pain in my knees tells me it was a wise decision. One of the areas I wanted to visit while in Nova Scotia was Blomidon Provincial Park. It lies approximately 20 kilometres north of Wolfville, 600 feet above the water, and provides magnificent views across the bay. Although not a long distance, it can be challenging especially the last climb and switchbacks up to the park. Fortunately, I was able to leave some gear with friends in Wolfville. Zander and I cycled through fields of corn, strawberries, and vegetable gardens, pastures with cows and pigs, and views of the bay—or should I say the mud flats since the tide was out. 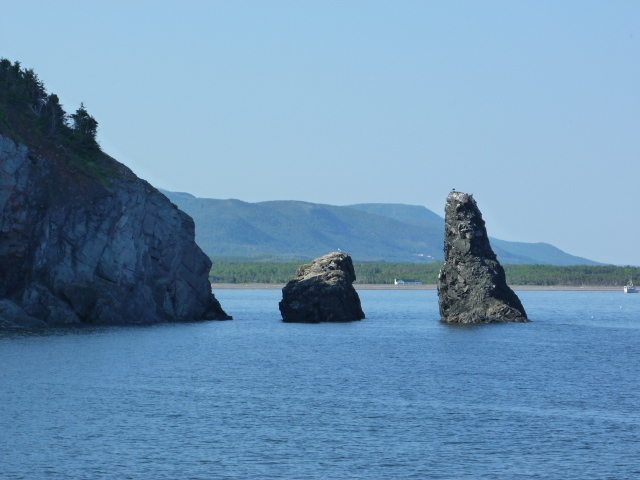 Since I am now at the “head” of the Bay of Fundy, the difference in the tides can be 15 metres or 50 feet; it has the highest tides in the world. The height is impressive, but I find the changes in the “width of beach” the most impressive. At times, I looked out and could no longer see where the water created a shoreline! The cycle up to the park was done on a bright, warm, sunny day. The park is at the top of an incredibly steep hill. 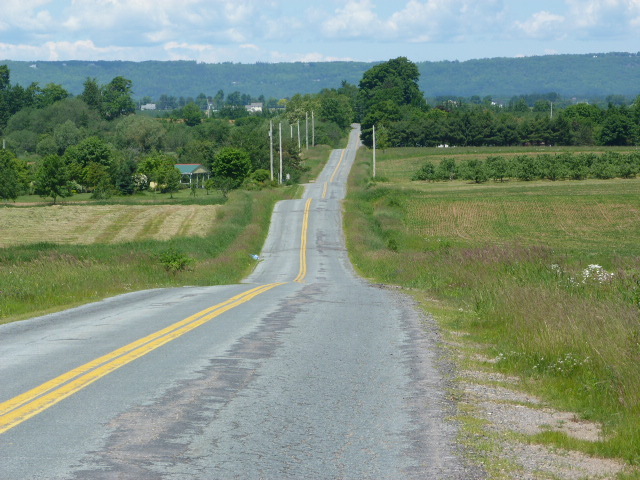 However, the last six kilometres also have some hefty rolling hills. A father-son team in those last six kilometres passed me. Their steady pace seemed quite fast and strong, so I thought they might have made it up the hill. They were able to go further up than I, but even they were reduced to walking with a loaded bike. The father thought his son might be able to do it without a load, but he and I felt confident neither one of us could do it even without a load!! But all the effort was worth it!! The park is 600 feet above the water and provides magnificent views across the bay. 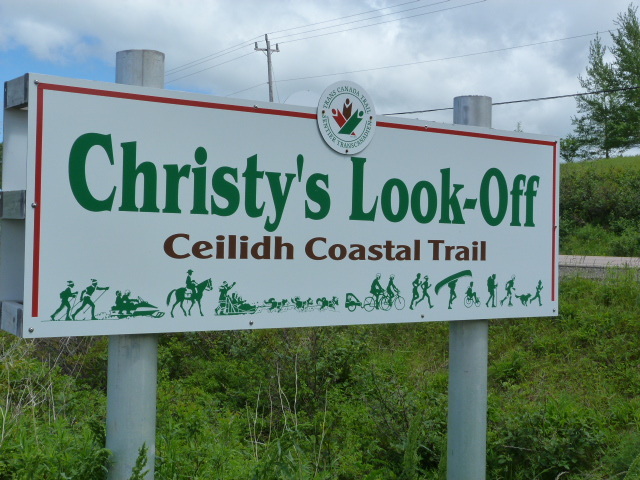 There are about 14 kilometres of hiking trails through woodlands, “bog-like” areas with lots of ferns, and access to the beach. When the tide is out, you can walk quite the distance into the bay. In addition, we were early in the season, so the squirrels were quite brave, and Zander enjoyed chasing them back up into the trees. And the small, black rabbits were so cute and allowed us to get quite close. Zander is relatively quiet and calm around rabbits, because our favourite pet store in Edmonton has rabbits for pets. Zander goes in quite gently to great his pal each time we buy food! The wind came up in the late afternoon—and boy does it blow at the top of the cliffs!! It was a good thing that I had staked the tent well, because the sides of the tent were blown in and the fly fluttered madly! And the night sky was clear so the stars once again shone in the sky!! It is such a delight to be able to see them so clearly. The day we left Blomidon, it rained—and rained quite hard. The rain cape came out, and Zander was quite soaked for some time!! Since the temperatures were warm, the rain did not make us feel cold, although Zander is never fond of getting wet. And even though there were some tough hills on the way home, it took us less time to make the trip back to Wolfville. That evening, Sue and John took us to the Wolfville farmer’s market for dinner. You pay $10.00 and get 5-$2.00 coupons, a plate with salad and bread. The coupons go for buying food from local vendors. The choices were a pork slider, Moroccan food, Indian samosas and pakoras, Italian pasta, German schnitzel, vegetarian fare, and gelato. It is every Wednesday during the summer, I believe—and quite the social affair. It was a great ending to two days of solid, challenging bicycling and hiking.